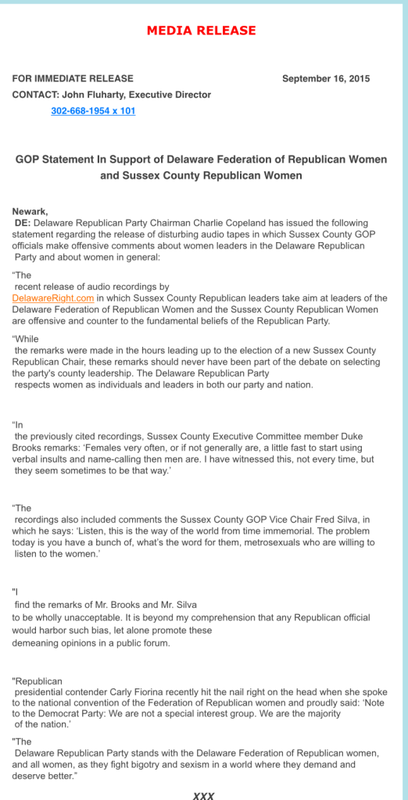 This is the press release from Delaware Republican Chairman, Charlie Copeland to the release of audio tapes here at Delaware Right, which exposed the behavior, and language used by Sussex GOP Committee members, in regards to women of the Republican Party in particular, and women in general. This is a link to article here on Delaware Right. 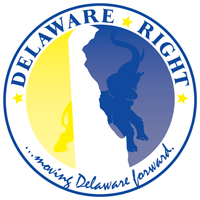 18 Comments on "PRESS RELEASE; DELAWARE REPUBLICAN CHAIRMAN CHARLIE COPELAND"
And thank-you Charlie for the great job you’re doing for the GOP in SOSNCC. Getting slapped around by Mr. Copeland will prolly not have much of an impact. The fact that the EC is being exposed for their actions is priceless. I especially like it when Duke Brooks doesn’t let the actual meteorologist for the radio station give the weather report because Duke is too busy pontificating his layman’s take on the weather scenario, which is usually incorrect, but out of politeness, the real meteorologist just let’s him go on. 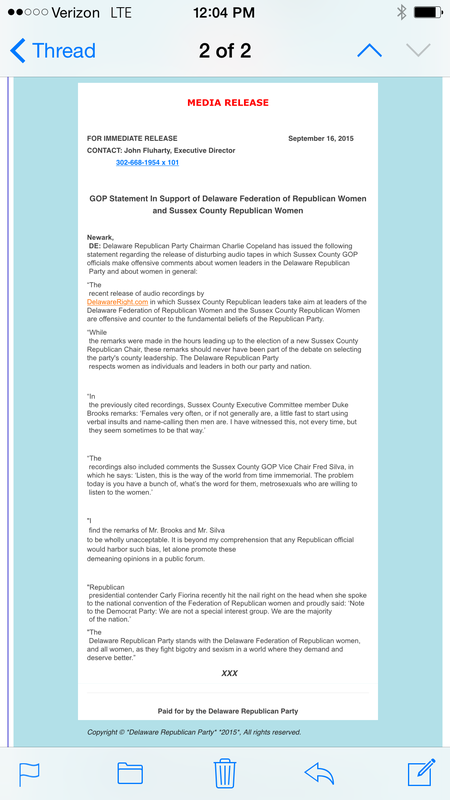 The Delaware Federation of Republican Women and the Sussex County Republican Women’s Club need to close the checkbook and pull out of all SCGOP events until these cretins are purged from leadership positions. You can’t take their money with one hand and publicly slap them in the face with the other. Copeland was a key figure in getting Ken Simpler elected, WTF have you ever done for the party in Delaware, Rick? Bulls#!t. Simpler’s credentials and Simpler’s opponent got Simpletr elected. WTF have you ever done for the party in Delaware, Rick? I’m not being held as an example of GOP party leadership. Copeland is.And in NCC and to an ever-growing extent in Kent, the GOP party leadership is failing miserably. Period. Rick, just stick to the things you know, like whining about Republicans; you don’t know jack sh*t about who actually does what for candidates in this state, as illustrated by your comments. In Sussex, BTW, it’s the WOMEN who drive the local campaigns. They work the phones for the GOTV efforts, they send out candidate’s mailings, they are the majority of the Republicans out on weekends doing lit drops. It’s time these Republican Women’s organizations in Sussex show as**oles like Fred Silva, Bruce Fitzgerald, Tom Jordan and Billie Carroll what it’s like when Sussex County women close the checkbook and stop doing all of the campaign work. Rick, would you like to tell us how much money the Sussex GOP Executive Committee donated to any of the Republican candidates since 2010? Don’t bother, I’ll tell you, $0.00!!!!!!! And yet you and Duke Brooks continue to talk about how this committee has been responsible for the Republicans who have been elected. Until you can give clear examples of anything that committee has done to elect Republicans, then just be quiet, because you don’t know what you are talking about. When was the last time you were even at a GOP meeting? 2010? If you want to know why Republicans in New Castle County don’t do better in elections look no further than the embarrassing antics of SCGOP. Chairman Copeland needs to do more than just send off a press release, heads need to roll, and until they do, I’m with Lindsey, my checkbook is also closed and I have no time for stuffing envelopes, lit drops, or phone calls. Copeland is a lift wing piece of crap. What has Copeland done for GOP candidates in Kent and SOSNCC? Nothing. BTW, it’s the WOMEN who drive the local campaigns. Maybe so, but it’s the supposed men- you and Knotts, et. al.– that are doing the whining. Copeland, keep out of Sussex- the GOP is doing just fine here. Worry about your own back yard. First to “Wrong”, thank you for again demonstrating the depth of the far right fringe’s intellect. Again Rick, tell us exactly what the Sussex Committee has done to elect anyone? Or is it just their existence that causes it? And again Rick what have you done for Republican candidates? Except to call them all liberals at some point. Oh by the way heard you on Dooby Brooks show, think you got a little something brown under your nose there friend. Rick, The Sussex GOP gives absolutely no (zero, 0, zip, zilch) help; either financially or physically to successful candidates in Sussex. They back the Bodenweisers and Christophers of the party. The ones that rank-and-file true republicans cannot relate, and are unelectable in the general elections. The current committee is only representative of the fringe element of the party. The committee must be replaced; especially if the leadership does nothing to address this debacle and intends on continuing the practice of ignoring the issue. First, to be clear, Copeland had as much to do with Simpler’s win as the Sussex GOP had with the wins in Sussex. Which is to say absolutely none. Second, I’ve worked campaigns in Sussex for over 30 years, and it is always the women who do the heavy lifting and grunt work. Shame on these wannabes for polluting the airwaves with their garbage. None of them have ever gotten anyone elected. They only matter when they do stupid like this. Rick, The Sussex GOP gives absolutely no (zero, 0, zip, zilch) help; either financially…. How many seats do the Socialist-Democrats hold in Sussex? Frank and the rest of the “cross-the-aisle” vacilllators on this blog who insist on finding problems where none exist won’t be happy until the GOP is in the minority here in Sussex, just like in the homeland of the high-intellect “moderates” (I.e., appeasers) in SOSNCC. Brilliant. Rick, let me help you. The reason you can’t name one thing the Committee has done to help elect Republicans, is because there is not one thing they have done. But you would have been so proud of your fringe friends in the Committee taking a victory lap and claiming responsibility for getting Ernie Lopez elected. This after the very same people called him a liberal interloper. Just because the Committee exist, does not mean it has anything to do with winning elections. In four months the committee will be out of money, they will closed the headquarters, they will stop having meetings, no website, and still I guess you will claim victory. ← Does The Sussex GOP See Women As Second Class Members Of The Party?